Many of you know that I'm a bit of a Japan-fan. In fact, that's probably putting it a little mildly ;-) Ever since I took Japanese as my minor at university, I have had an ongoing love affair with the country and its language. I feel so lucky that R has embraced the country and its culture, too. Find him a good mountain to hike, a post-hike onsen to take a dip in, and a tasty bowl of ramen, and he's a happy man! The Japanese will bend over backwards to help you. Even if you meet someone who doesn't speak a word of English, somehow they'll figure things out for you. From the bus conductor who ran along the platforms to find our bus, to the retiree-age volunteers at the station who escorted us to our platform, or the delightful man bowing at us from outside his motorway toll booth, Japanese hospitality and politeness are second to none. Even though the sushi is awesome, especially if you head for breakfast at the Tsukiji fish market in Tokyo, there are so many other yummy Japanese treats – and attention to detail is amazing. I love how you feel pleasantly full, as opposed to German "Käsepätzle"-full! We'll tell you a bit more about the culinary delights in another post. With around three quarters of Japan's land being mountainous, you can easily enjoy the best of both worlds. It's just a short ride away from the buzz of the cities to the fresh air and most fantastic mountain scenery. It's a winning formula for us! There's nothing like stripping down to your birthday suit once in a while and soaking away your cares or achy legs in a natural hot spring (onsen). And if it's a rotenburo (outside bath), then all the better! Our favourite hot spring experience was on the island of Yakushima, where, if you got your timing right and went within two hours either side of low tide, you could relax in the thermal rockpools with the waves crashing just metres from you. Onsen bliss! My Japanese will never be too hot, but bless the Japanese for continually complementing my feeble attempts! I just can't shake off my love of the language and, although I must have made many clangers, any attempt to converse in Japanese is met with an enthusiastic welcome. I often get asked if it's difficult. Well, it's no walk in the park, but you know, when your heart's in it, that's half the battle! 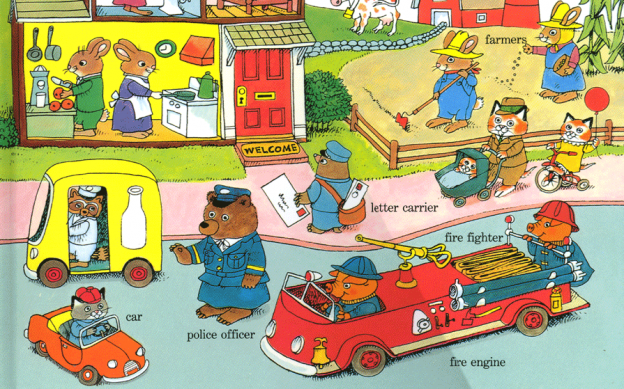 When I was a child, I had an adorable book by Richard Scarry, which portrayed Busytown where everything ran like clockwork. The illustrations showed scenes of an orderly town with animal characters, such as pigs in cute little firefighter uniforms or a fox repairman in his overalls. I hope I don't offend my Japanese friends when I say Japan reminds me of the world of Richard Scarry – I mean it in the most positive way! With its small square cars, orderly uniforms, and the cutest signs warning you of dangers or roadworks, I just can't help thinking back to my favourite toytown read. It's adorable! Just take a look at R in slumber bliss! Need I say more? Where else can you hear so many jingles? Pachelbel's Canon tells you that the bath water has reached the right temperature, Old MacDonald plays on the station platform, a rendition of Oranges and Lemons tells you that the washing machine is done, twinkly Beatles covers play on the ferry, and community speakers play Edelweiss before the local announcements. Even the rubbish collection trucks play twinkly songs as they collect your rubbish. I love it! For such shy people, the Japanese make a loud fashion statement. Hats, bold colours, huge platform shoes, and tailored shorts with tights. Then there's the half pulled-on beanie hat with doc martens and long denim dungarees dress with checked shirt look. Either that, or they look like they've jumped off the pages of a comic book - there are some serious cosplay fans out there! There's something mildly surreal about sitting at a ramen bar, surrounded by everyone slurping their noodles loudly – just as your mother told you not to! It's all part of the noodle-eating-etiquette in Japan. You know that annoying clatter of the keyboard sound of those people who insist on typing in meetings? There's none of that on Japan's high-speed railway network, the shinkansen. Signs remind you to "be considerate when using your laptop" and to turn your mobile to "manner mode" (silent) to avoid annoying your fellow passengers. After all, they just want to sit back, enjoy their bentobox, and revel in the peace and quiet as much as you do. As a British lass, who knows the "delayed 14:27 from Birmingham" announcements all too well, the more punctual German trains have been a breath of fresh air. But the shinkansen's record of averaging less than one minute delay, plus its canny technique aligning its doors directly with passengers waiting on the platform, really is the icing on the cake! Festivals are a big deal in Japan. Over 100,000 take place each year and an incredible amount of energy and passion go into them. At the Danjiri festival in Kishiwada, just south of Osaka, a small army of people pulled the huge wooden float that went whooshing past the masses who were lapping up the electric atmosphere. There are plenty more festivals that we'd love to see, including the Awa-odori festival on the island of Shikoku. We only got a taste of the action at the museum in Tokushima, but every year in August, the streets of the relatively small city of around 260,000 come alive when over 1 million tourists come to see scores of dancers performing to honour the spirits of their ancestors. One minute you're craning your neck at the impressive skyscrapers architecture, the next minute you're admiring the elegant lines of a shrine or temple. The mix of old and new never fails to fascinate me.